The Telling Part of the Story of Northern Tasmanian WWI ANZACs book and website project involved researching the 165 ANZAC servicemen named on the War Memorial at Holy Trinity Church, Launceston. This involved searching each Serviceman’s war record and refers to his life before and after World War 1. Many hours were spent identifying records and extracting information from the digitised collection in the National Archives of Australia and elsewhere. 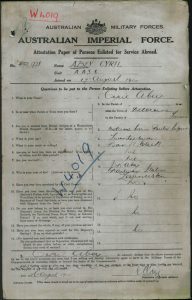 The picture above shows the first page of 37 pages of Cyril Abey’s record, and provides some indication of the difficulty of the task. Often records were incomplete or damaged. There are many significant stories located within this set of names. 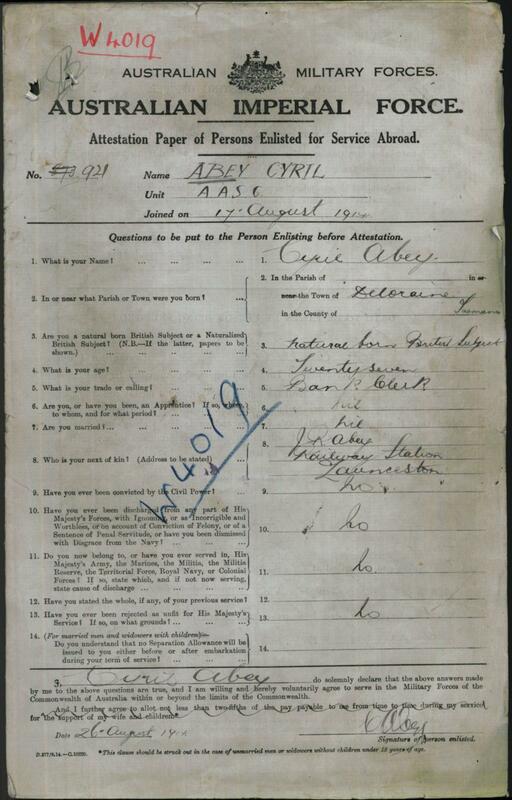 A number of the servicemen were at Gallipoli and some were killed there; others received important awards for bravery during WWI, including Cyril Abey, who received the Military Medal. These 165 servicemen served in a number of battalions including the 40th Battalion AIF (Tasmania), formed in 1916. Service included members of the Signal Squadron, the Flying Corps, and the Engineers. The stories of these men illustrate a cross-section of Tasmania’s and Australia’s contribution to the 1914-1918 war. Information about these servicemen and related information is presented in the form of this book publication and on a website (www.165ANZACs.org) which is accessible to schools and the public. An important part of this project was designed to encourage students and others to interact with the data file developed on the 165 ANZACs. This data file can be freely downloaded from the project’s website. The development of this data set involved converting the information into a form that could be used in primary and secondary schools throughout Australia and elsewhere. The Australian national curriculums for Mathematics, and Information Technology requires students to work with real data sets. In Australia this 165ANZACs data set has application to Mathematics and Information Technology focussed subjects as well as the History and English curriculums. Well-constructed data sets that have been professionally developed for schools and the community can have significant ongoing sustained usage and help to bring the reality of past events to new audiences of young minds. The data obtained for each of the names on the memorial board have been turned into files suitable for use by schools. 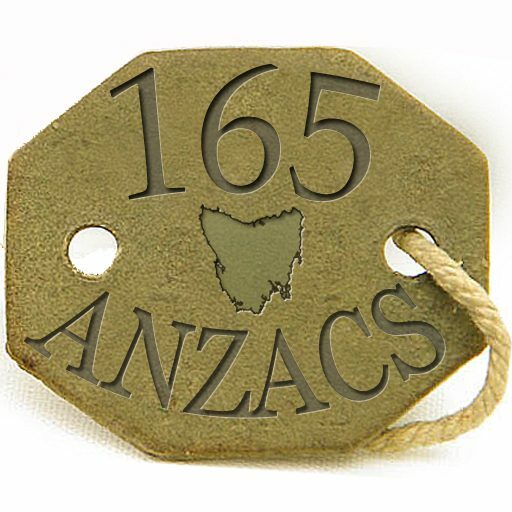 These files are available from the 165 ANZACs website (www.165ANZACs.org). As well as a standard spreadsheet, such as an Excel file, the file is also available as a Tinkerplots file (www.tinkerplots.com). Tinkerplots is a data visualisation tool designed for students from Year (Grade) 4 upwards. Using this tool gives students the opportunity to investigate and display a range of issues of interest to themselves by working with the data file. Students can “get to know” an ANZAC by selecting one of the dots on the graph at random. They then use the information on the ‘card’ to write a short pen portrait of the ANZAC. This exercise helps students not only to understand the information presented but, more importantly, to recognise that the ANZACs commemorated on the memorial were real people. ANZAC number 143 is James William Sutton. He is recorded on the Memorial as William B Sutton. He was born on January 15th 1888 to James William and Emma Louise Sutton in Launceston. He served for 2½ years in the cadets. In 1915 he enlisted at Enoggera, Brisbane. At the time of his enlistment he was 27 years and 5 months old and was not married. His occupation was described as Collector so he might have been a debt collector for a moneylender or bookmaker. He was not very tall, at 5 foot 4 inches (about 160 cm), and weighed 10 stone (about 63.5 kg). He served in the 26th Battalion, leaving Australia from Brisbane on the ship Aeneas. He survived the war, returning to Australia on the ship Pakaha. The average (mean) age of the ANZACs at the time of their enlistment was 24.69 years but the median age was 22.88 years indicating that the group was predominantly young men. The oldest soldier on the memorial is Charles Augustus Littler, who was 46¾ years old when he enlisted in Melbourne in 1914. He became known as “The Duke of ANZAC” and was responsible for managing stores and supplies at ANZAC Cove. There are three soldiers who were under-age when they enlisted, lying about their age so that they were accepted. The youngest was Edric Taylor, who was only just over 16 years old when he enlisted. Alec Campbell, also 16 when he enlisted, became the last surviving ANZAC before his death at the age of 103. The third under-age soldier was Thomas Carr, who was also one of the tallest at just over 6 foot (180 cm).